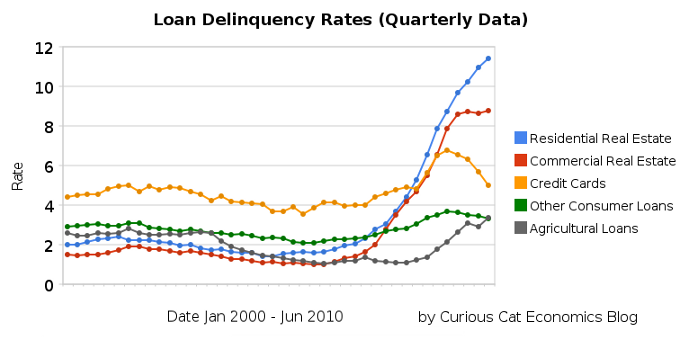 The first half of 2010 saw residential real estate delinquencies continue to increase and other consumer loan delinquencies decreasing (both trends continue those of the last half of 2009). Residential real estate delinquencies increased 118 basis points to 11.4%. Commercial real estate delinquencies increased just 7 basis points to 8.79%. Agricultural loan delinquencies also increased (25 basis points) though to just 3.35%. Consumer loan delinquencies decreased, with credit card delinquencies down 131 basis points to 5.01% and other consumer loan delinquencies down 15 basis points to 3.34%. 30 year fixed mortgage rates have declined sharply recently to close to 4.5%. If you are considering refinancing a mortgage now may well be a very good time. If you are not, you maybe should consider it. If so look to shorten the length. If you originally took out a 30 year mortgage and now have, for example, 24 years let, don’t add 6 years to your repayment term by getting a new 30 year mortgage. Instead, look to shorten your pay back period with a 20 year mortgage. The 20 year mortgage will have an even lower rate than the 30 year mortgage. If you plan on staying in the house, a fixed rate mortgage is definitely the better option, in my opinion. If you are going to move (and sell your hose) in a few years, an adjustable rate mortgage may make sense, but I would learn toward a fixed rate mortgage unless you are absolutely sure (because situations can change and you may decide you want to stay). The poor economy, unemployment rate still at 9.5%, has the Fed continuing massive intervention into the economy. The Fed is keeping the fed funds rate at close to 0%. If you are looking at a new real estate purchase, financing a 30 year mortgage sure is attractive at rates under to 4.5%. 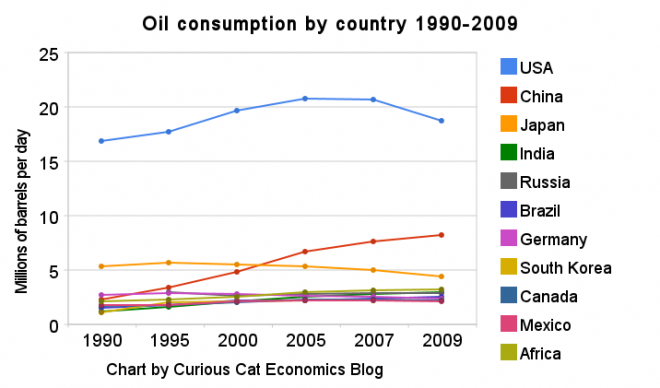 The United States uses far more oil than any other country. The chart shows this very well. The chart shows all countries using over 2 million barrels of oil a day. The USA consumed 18.7 million barrels a day in 2009. Only China was also over 5 million barrels, they reached 8.2 million in 2009. Japan is next at 4.4 million. The data is from the US Department of Energy for total consumption of petroleum products. Mexico, Canada, South Korea, Germany, Brazil, Russia and India all use between 2 and 3 million barrels a day. All of Africa is at 3.2 million. We have created a new and improvement Curious Cat Investment book site. Find great resources for your investing and personal finance needs. 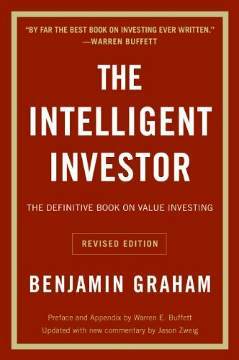 We have selected the best books by authors including: Benjamin Graham, Warren Buffett, John Bogle, Nicolas Darvas, Peter Lynch and William O’Neil. Try out our recommended picks. View the books by category including: investing, economics, retirement, real estate and personal finance. For the first time since the start of the financial crisis in August 2007, U.S. investors own more Treasuries than foreign holders. Mutual funds, households and banks have boosted the domestic share of the $8.18 trillion in tradable U.S. debt to 50.2 percent as of May, according to the most recent Treasury Department data. The biggest jump in demand this year among domestic buyers of Treasuries has been commercial lenders. Bank holdings of Treasury and agency securities increased 5 percent to $1.57 trillion last month, according to the latest data available from the Fed. The Fed’s decision to hold its target for the overnight lending rate at a record low has made it possible for banks to borrow at near-zero interest rates to finance purchases of longer-term and higher-yielding Treasuries while lending less. I must say, unless you are getting special government interest free loans to invest in treasuries (like those that caused the credit crisis are) it seems crazy to me to invest at these low rates. In retirement, it probably does make sense to have some just as a diversification measure but other than that I would certainly reduce my holdings from what they would have been 10 years ago. If politicians or the fed would just give special favors to me to borrow billions and essentially 0% and then lend it back for more I would take that deal. But if I am not granted the welfare Chase, Goldman Sachs, Citibank and the rest are (with huge amounts of free money and bailouts if their bets fail) buying extremely low yield government debt is not an investment I want. I don’t think betting on deflation is not a bet I want to take. Inflation seems a bigger risk to me. But people get to make their own decisions, and we will see which investors are right. Consumer debt decreased at an annual rate of 3.25% in the second quarter. Revolving credit (credit card debt) decreased at an annual rate of 9.5%, and nonrevolving credit (car loans…) was about unchanged. Revolving consumer debt now stands at $827 billion down $39 billion this year. That is on top of a $92 decline in 2009. Hopefully we can continue this success. Through June of 2010 total outstanding consumer debt was $2,419 billion, a decline of $30 billion ($21 billion of the decline was in the 2nd quarter). This still leaves over $8,000 in consumer debt for every person in the USA and $20,000 per family. Consumer debt grew by about $100 billion each year from 2004 through 2007. In 2009 consumer debt declined over $100 billion so far: from $2,561 billion to $2,449 billion. Thankfully over the last year at least consumer debt has been declining, but it needs to decline more. I disagree with those that want to see short term improvement in the economy powered by consumer debt. It would be nice to see improvement to the current economy. But we can’t afford to achieve that with more debt. Government debt has been exploding so unfortunately that problem has continued to get worse. Welcome to the Curious Cat Investing and Economics Carnival: we highlight recent personal finance, investing and economics blog posts I found interesting.